This tutorial outlines how to use Bamboo to run, and get rapid feedback on, builds for your Java project. Bamboo has the concept of a 'plan' to look after the configuration for your continuous integration workflow. So, to run your first build, you'll create and run a Bamboo plan. This tutorial assumes you are using Bamboo Cloud, which allows us to make some assumptions about the resources available to Bamboo. You can still use the tutorial if you are using Bamboo Server installed on your local network. You just need to make sure you or your company administrator have properly installed and configured Bamboo for running plans. We also assume you have an individual Bitbucket account. If you don't, it only takes minutes to create one, and you can always delete it after you're done. Log into your Bamboo instance as a user with permissions to create plans. Choose Create > Create a new plan from the menu bar. Every plan belongs to a project. We don't have a project yet, so choose Project > New Project, and enter details for both the project and plan. Bamboo needs to know the plan name, plan key and a brief description of what the plan is for. Bamboo needs to know where the source code repository is located, and needs permissions to access the repo, so that it can check out the code when it runs a build. 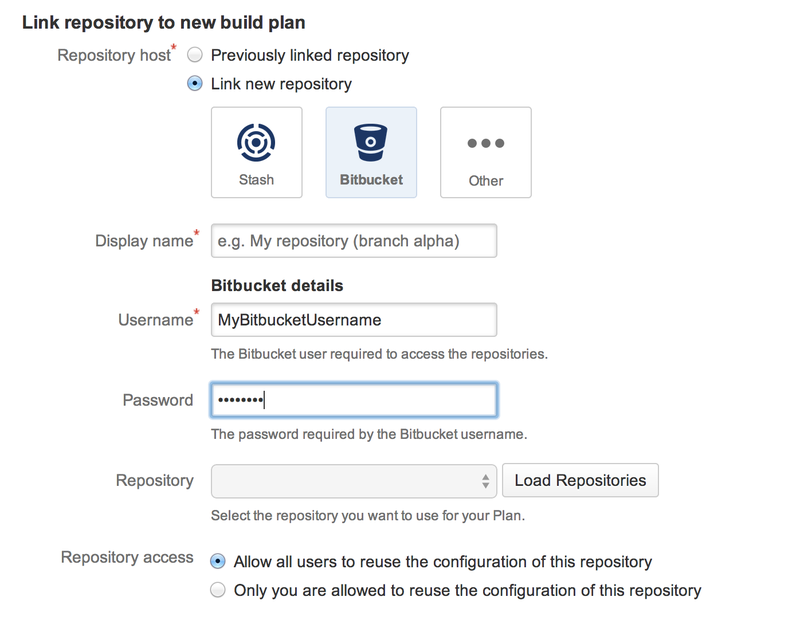 Enter your Bitbucket credentials, and click Load Repositories to browse to your repository. Connect to the demonstration atlassian_tutorial/helloworld repo on Bitbucket for this tutorial, if you like. See Linking to source code repositories for more details. Leave the Trigger IP addresses setting empty. See Triggering builds for more details. Each plan needs to have at least one task specified. Tasks do the real work of the plan. A newly created plan has a default Source Code Checkout task that gets the source code from the source repository specified earlier. See Checking out code for details. We also want to compile the code, and run the unit and integration tests. We'll add a builder task to the Bamboo plan to do that. We assume that your project already has a build process set up that Bamboo can call. See http://ant.apache.org/manual/index.html for information about Ant. Bamboo also supports Maven 1.0 and Maven 2.0. See http://maven.apache.org/ for information about Maven. See http://grails.org/doc/latest/guide/index.html for information about Grails. A build tool needs to be installed on the Bamboo server machine before you can use the Bamboo task. There are plugins available for Bamboo that add build tasks for other tools, such as Gant and Gradle. See the Atlassian Marketplace for details. Your tests will be run when the builder task compiles the code. Each of the builder tasks above has a section to tell Bamboo to expect test results and where to look for them. You can specify a custom results location if your project directory doesn't use the conventional structure. See Configuring jobs and Configuring tasks for details. Enable the plan, and click Create. The 'Plan Summary' tab will report whether the build succeeded or not. Tests in the appropriate directory in the source code repository will be run automatically as part of the build, and the test results will be displayed in Bamboo. Now, whenever you commit a change to the repository, Bamboo will build your source code and report on your test results. Bamboo displays a summary of the results of the build on the dashboard. Build results for one or more plans can be displayed on a wallboard. You can get notifications about build results sent to you by email, IM and RSS feed. You can get build statistics about plans, and about developers contributing code to the build. You can drill down into the results to see the code changes that triggered the build, and the tests that were run for that build. See Getting feedback for details.